The trace route results and error messages are displayed on the Results window (Fig. 1) and can be displayed on the map by arrows between hosts (Click Show on map to do this). Fig. 1: The Traceroute window. 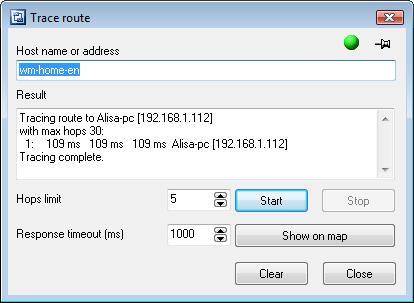 To perform the route tracing process faster, enable the Do not detect DNS names setting. The tracing process can be cancelled before its completion by clicking the Stop button.